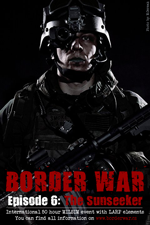 Vom 25.04 bis 27.04.2014 findet die sechste Operation Border War statt. Zusammen mit der 768th SFS werden wir mit über 14 MILSIM Spielern dort vertreten sein. Gemeinsam unter dem Namen "AFSOC Germany" werden wir dort auftreten. I am sure this piece of writing has touched all the internet people, its really really nice piece of writing on building up new weblog. If you would like to grow your know-how just keep visiting this web page and be updated with the most recent news posted here. Hello friends, how is everything, and what you desire to say concerning this article, in my view its actually remarkable designed for me. Hi there to every one, for the reason that I am actually eager of reading this blog's post to be updated regularly. It includes nice material. Hello my loved one! I wish to say that this post is amazing, great written and come with approximately all vital infos. I'd like to peer more posts like this . Hi, after reading this awesome article i am as well delighted to share my familiarity here with colleagues.